Easy Sweet And Sour Pork Recipe | Low Carb, Keto-Friendly! Chinese food is back on the menu with this Easy Sweet and Sour Pork recipe! 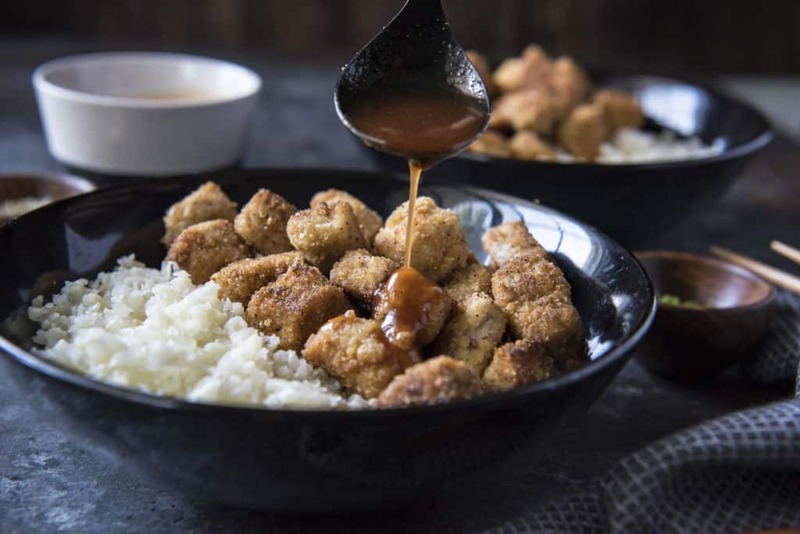 We use pork rinds to create the perfect crispy breading and five simple ingredients to make a low carb, sugar free sweet and sour sauce. What we love most about this recipe is how filling and flavorful it is. Make it tonight for dinner! When it comes to most dishes, it's the sauce that has all the hidden sugars and carbs, so why not make your own sauce at home! It can seem intimidating, but we have a fool proof low carb sweet and sour sauce using no sugar added ketchup! All it takes is some heat and patience to make this delicious sauce. Our Favorite Keto Chinese Food! Chinese food is one of those guilty pleasures we used to order in bulk on drunken nights or holidays where cooking wasn't an option.We all have a special place for it, but stay away now that we are low card/keto. You don't have to feel like you're missing out, and cooking at home will get the entire family involved! If you've been craving Chinese food (just like us! ), but can't find a place that satisfies your low carb needs, you're in luck! 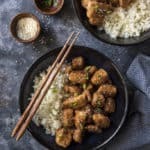 You can put on your pjs and whip up some homemade keto Chinese food tonight. Serve this easy sweet and sour pork recipe over cauliflower rice to soak up all the delicious sweet and sour sauce. 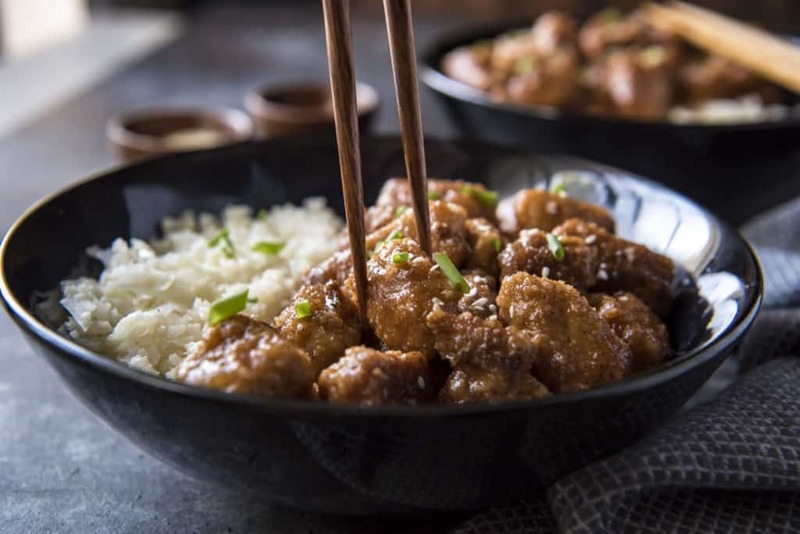 Recipe can be quickly added to MyFitnessPal - Search "KetoConnect - Keto Sweet And Sour Pork"
In a large bowl, combine pork rinds, ginger, onion powder, salt, and pepper. Mix well. In a separate bowl, whisk the eggs together. Cube pork into 1 inch cubes (even as possible makes for easier cooking), then dunk the pork in the egg and roll in the pork rind mixture. Place on a plate. In a cast iron skillet, heat the oil over medium heat. Fry the pork in batches. About 2 minutes on each side (pork should not have any pink in the middle). Transfer to paper towel lined plate to absorb some oil. Make the sauce:​ Heat a medium saucepan over high heat. Add all sauce ingredients to the saucepan. Stir frequently, allowing it to boil and thicken and to not burn. Pour the sweet and sour sauce over cooked pork. Coat pork thoroughly and serve with cauliflower rice and optional steamed broccoli. Optional, sprinkle with sesame seeds and green scallions. NOTE: nutrition does not include fat for frying. Difficult to estimate.